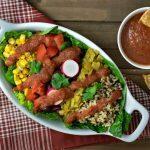 Burrito Bowls are super healthy and pretty easy to make. The secret to an AWESOME Burrito Bowl though is the sauce. So I copied one of my favorite restaurant’s sauce to give you this amazing Vegan Ranchero Bowl. Simply take all your favorite burrito fixin’s like brown rice, your favorite beans, corn, and green chile, and layer it on a bed of crisp romaine lettuce. Top it off with some garnish like freshly chopped tomato, radish, and cilantro – and then smother it in a sauce. We could practically call it a burrito salad! Not only is it super healthy, very low-fat, and chock full of greens and vegetables…. it’s also very nutrient dense and we didn’t add a ton of calories. But like any good burrito (or salad), you HAVE to have a good sauce to make it delicious. So like last week where I brought you my wife’s favorite Tomatillo Avocado Sauce from our favorite Mexican Restaurant…..this week I bring you my favorite. A slightly spicy Ranchero Sauce, which is what most of this blog post and accompanying recipe will be about. A Ranchero Sauce is nothing more than a tomato sauce with a little kick from fresh Mexican Chile Peppers. In this recipe, I use both a Jalapeno Pepper and a Serrano Pepper to give it some zing …while adding onion, garlic, and cilantro for added depth of flavor. This sauce is super easy to make with your stovetop and blender, and the ingredients should be easily found in any grocery store. You can also use this Ranchero Sauce over your hash browns or baked potatoes, rice, or even eat it plain as a spicy Mexican Tomato Soup. Eating the way we do can be pretty simple at times. We (myself included) don’t always make fancy recipes for our day to day meals, so having a tasty sauce to brighten up our potatoes, or salads can make all the difference in the world to enjoying our WFPBNO lifestyle and never getting tired of the same, simple foods. So what say you? Ready to make some sauce? Let’s start by dicing a yellow onion, 1 jalapeno, and 1 serrano chile pepper. Make sure you remove as many seeds and membranes as you can from the chiles and also make sure you either wear gloves or wash your hands thoroughly after handling. All spicy chile peppers have an oil in the seeds and membranes called Capsicum that will burn your eyes if you happen to rub or scratch. True story. I was cleaning New Mexico Hatch Chiles one day many years ago when I lived in Albuquerque. I accidentally rubbed my eye and then scared the daylights out of my kids when I started screamy bloody murder. Next thing I knew I was laying on my back….on the kitchen counter….with my head underneath the faucet … using it as a make-shift eye wash, water spraying everywhere. Yes….it burns that bad, so be careful. Alright, add our diced onions and chiles to a large saucepan and add a splash of water or veg broth to prevent them from sticking, and saute these over med-low heat until they soften. Oh and if you really like spice? Sub out a second Serrano pepper or Habanero for the Jalapeno if you REALLY like it hot. Now we add 2 cloves of minced garlic and simmer for 30 seconds or so before we add our spices. I added cumin, garlic salt, onion powder, oregano, and black pepper and stirred them into my onions. Next, we add our tomatoes. I used a 28oz can of Muir Glen organic, fire-roasted, whole tomatoes. You could also use two 14.5 oz cans if that’s all you can find. OR…if they’re fresh and in season, you could add about 10 fresh tomatoes (about 2lbs). Cut them into pieces first before adding them into the sauce. Roasting them under a broiler for a few minutes would give them that fire-roasted flavor. Add 1/2 cup of water to thin and a small bunch of chopped cilantro and let the sauce simmer on med-low heat for about 30 minutes. The tomatoes will eventually break down into a rich, thick sauce. At this point I used my immersion blender to puree the sauce smooth. You could also use your blender. Or, you could leave it chunky if that is the texture you like. Take a taste and adjust any seasoning if necessary and your sauce is finished. 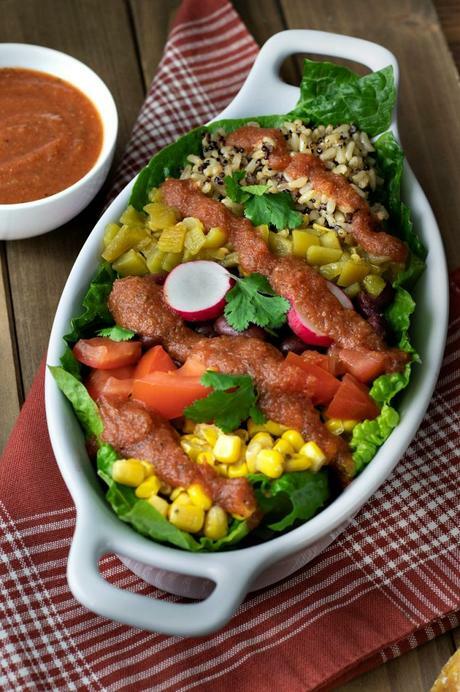 To make my Ranchero Bowl I laid down a bed of Romaine Lettuce and then added some fire-roasted corn, kidney beans, canned green chile, and brown rice. I then added chopped tomato, radish, and cilantro for garnish and spooned on my sauce. 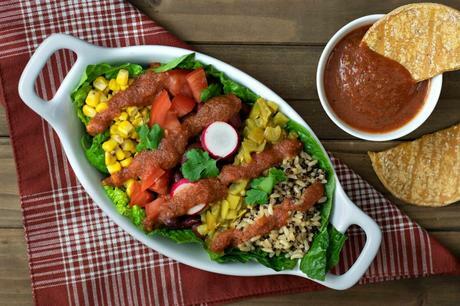 It’s your Ranchero Bowl – use whatever you have on hand or what you like. That’s my recipe for the week and I hope you enjoy it. I’ll see you back here next week for another WFPBNO recipe and until then….. This is Chuck from Brand New Vegan….thanks for visiting. 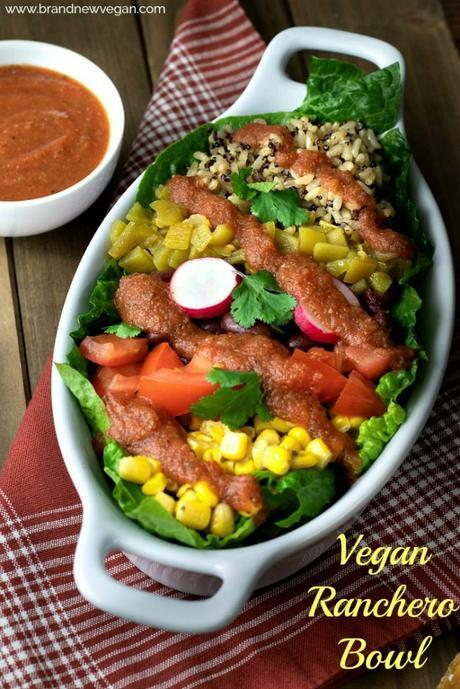 The secret to an AWESOME Burrito Bowl is the sauce, so I copied one of my favorite restaurant’s sauce to give you this amazing Vegan Ranchero Bowl. Remove stems and seeds from pepper and dice finely. Add to pan and be sure and wear gloves or wash hands thoroughly after handling peppers. Add 1-2 Tbs water or veg broth to pan and saute vegetables until softened. Add minced garlic and stir. Simmer for 30 seconds. Add cumin, garlic salt, onion powder, oregano, and black pepper and mix well. Simmer for 1-2 minutes. Puree if desired with blender.